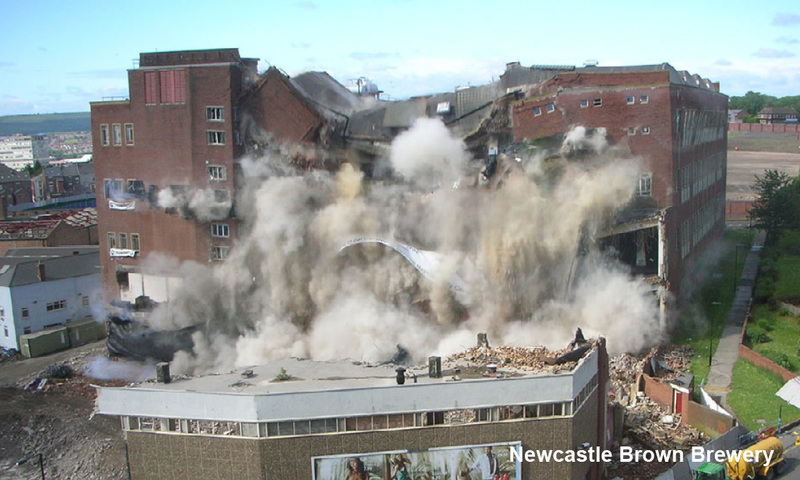 ASI handled the structural analysis and engineered demolition design that imploded the old Newcastle Brown Brewery building. On June 22nd, Sir Bobby Robson, pressed the button to detonate the explosive charges that brought down the old brewery. The 1960s reinforced concrete brewery structure was 60 meters square by 40 meters high. Controlled Group, the Yorkshire based Demolition Company collaborated with ASI for the first time in the UK and, the results were great. “The similarities between the predicted collapse and the actual collapse were impressive” said Controlled Structural Engineer, Rob Clarke. The designed collapse mechanism focused around the columns in the center of the building being destroyed first and then the floor slabs, with their vertical support gone, sagging like a heavy net and pulling the sides of the building into the center. Selected internal columns were detonated in a delayed sequence that forced one end of the roof to hinge at the external face and drop into the center of the building footprint. Using this collapse mechanism was essential to avoid structural damage to the flats and offices that were built only 10 meters away from the Brewery. It was also important to avoid any unexpected issues, such as rogue columns falling away from the building and potentially damaging the neighbors. ASI created a 3D model of the whole structure after estimating the hidden design parameters, such as reinforcement details and joint stiffness. All the weakening details for joints and columns were added to the 3D model. “It was comforting to see the results of the simulation were as we expected’, says Rob, ‘The software Extreme Loading developed by ASI calculated the freefall trajectory of each structural element and the interface forces between adjacent elements, both connected and separated, something which Finite Element Analysis is just not capable of.” After the dust had cleared the debris spread was seen to be just as predicted by Controlled and ASI. Studying the videos afterwards showed that the collapse had worked just as planned although there were some subtle differences. The speed of the drop was a little faster than expected. This was probably due to the fact that there were no internal walls left in the building to slow the collapse.